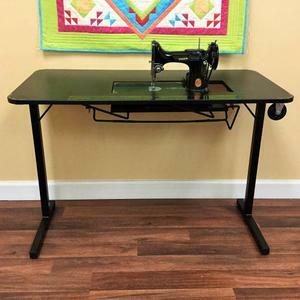 The Heavyweight Table is specially designed to fit your vintage Singer Featherweight! 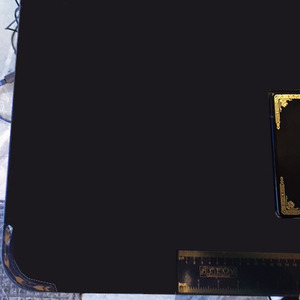 It has a beautiful black finish and gold decals that will complement your 221 or 222 beautifully. 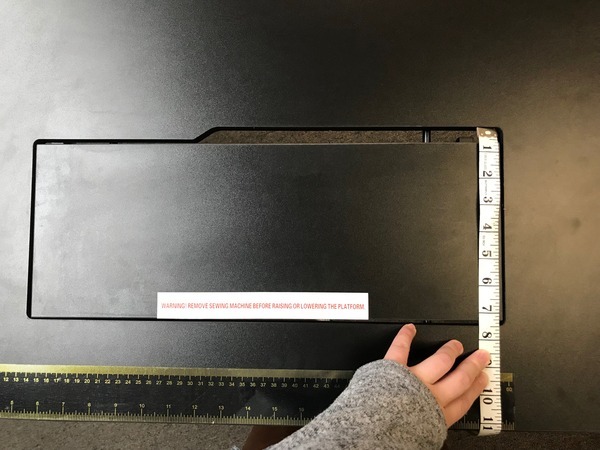 It is a sturdy table with an opening that is specifically sized to fit your Featherweight, so it offers free arm and flatbed sewing without the need for an insert. And contrary to what the name implies, it’s completely portable, so it’s perfect for taking to classes and retreats, or packing in your RV. Perfect fit is achieved with a platform specially designed for your Singer Featherweight sewing machine. Can move into two positions. 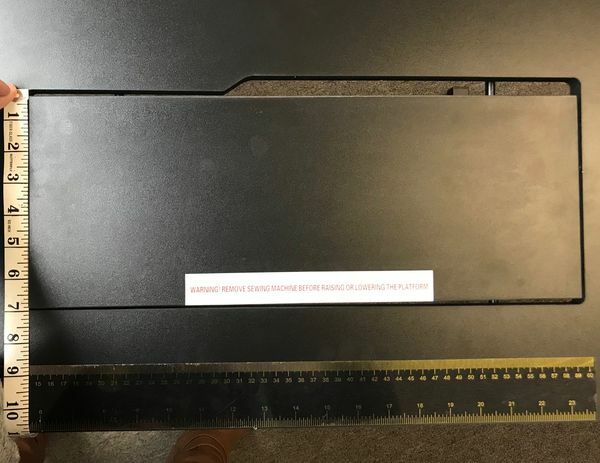 It can sit level with the tables surface, creating a freearm position for your machine. 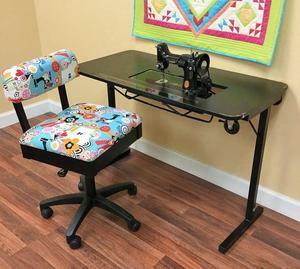 Or, you can lower the platform into the flatbed position, allowing the sewing bed to be level with the tabletop. Easy storage and transportation with folding legs made of super strong steel for lasting and reliable support move easily with the 2 wheels. To set up the table, simply open each one out, lock in place and stand the table upright. Then, if you need to put the table away, just fold each one down and store the now compact table in a closet or out of the way. With an opening sized for a Singer Featherweight Sewing Machine the flatbed position is easily achieved. 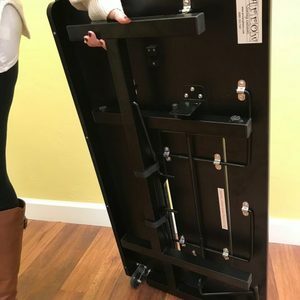 Fold the table legs up to reveal wheels that help you easily transport your table to classes, retreats, or on road trips. With clean, simple lines, complementary decorative accents on the black surface highlight your machine. Arrow Cabinets are constructed with a durable composite and finish to match any decor and last a lifetime with a 5-year warranty. Easy to take on the go since it only weighs 37 pounds. The steel locking legs offer a sturdy base, but fold up neatly for easy storage. It also has a Velcro strip to secure the legs in place and 2 wheels on the side of the table for easy maneuverability. And contrary to what the name implies, it’s completely portable, so it’s perfect for taking to classes and retreats, or packing in your RV. Arrow three- year warranty from the date of shipment that covers manufacturer’s defects; Arrow will replace parts for manufacturers defects.